Automatic Transmission was a pilot for Night Network on ITV in the UK, which I shot with Forbes Masson and Ross King late in 1988. 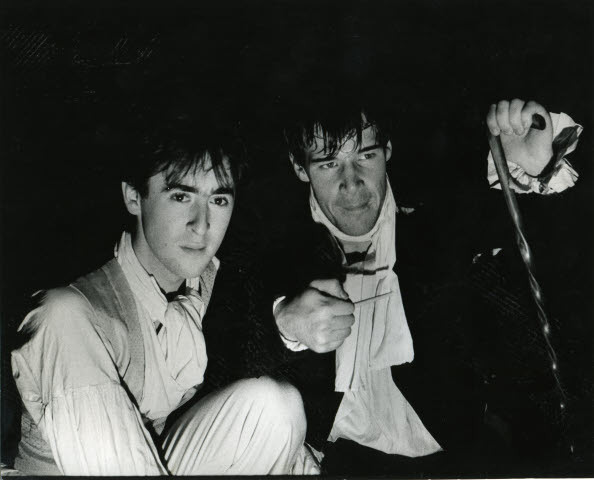 The premise was that Ross drove a huge old NYC taxi and the guests sat with him in the front, and Forbes and I, in our guises as Victor and Barry, were the car wash men who hopped into the back of the taxi and bitched about the guests in the front. Luckily we shot our bits on a different day from the guests! 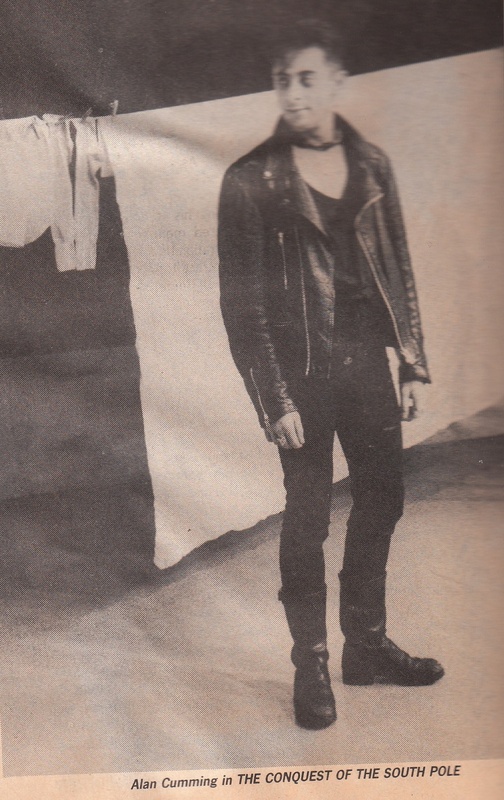 The pilot had The Boys, Sigue Sigue Sputnik and Pia Zadora as guests, but strangely it was never made into a series!! Also here is our first appearance on Night Network, singing our paen to Victor an Barry's favourite shop, Marks and Spencer! 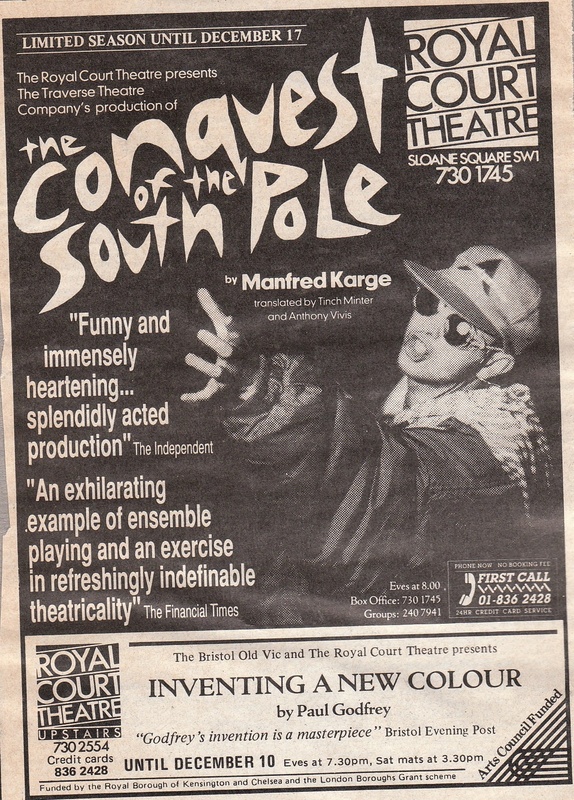 Conquest of the South Pole is by German writer Manfred Karge. I played Slupianek, an unemployed youth who went on an imaginary journey with his friends to the South Pole, emulating the real-life journey of Roald Amundsen. 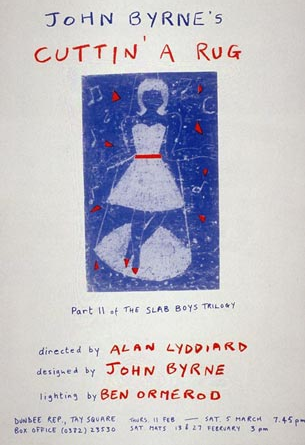 The play premiered as part of the Traverse Theatre's season in 1988, returning for the Edinburgh Festival and then transferring to the Royal Court Theatre in London for a limited season at the end of the year. 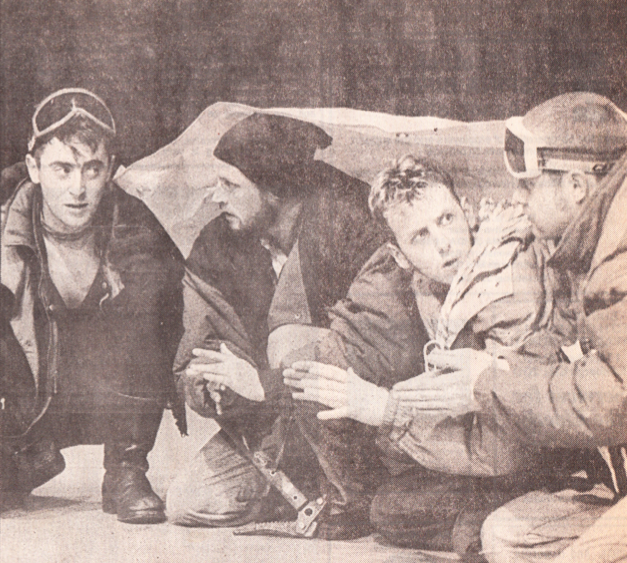 It was directed by Stephen Unwin, who would later direct me in Knickers and Hamlet. Tilda Swinton was assistant director. This play was huge for me because when it transferred to London I was nominated Most Promising Newcomer in the 1988/89 Laurence Olivier Awards (losing to Richard Jones who later would direct me in La Bête.) That was a big deal and I started to be offered work in London, and shortly after moved there. When I finished the run at the Royal Court I went to Australia to do the Victor and Barry tour and met a young actor who was playing Slupianek in the Sydney production at the Belvoir St Theatre. His name? Baz Lurhman! 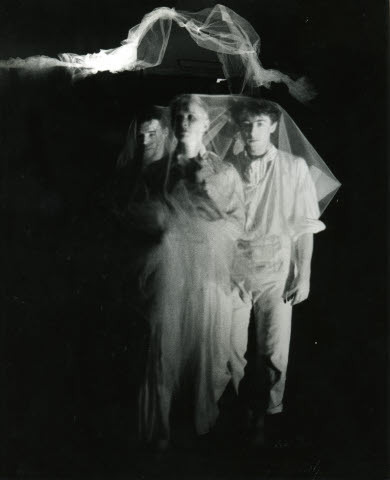 Great Expectations was a co-production between TAG (The touring arm of the Glasgow Citzens' Theatre) and the Gregory Nash Dance Group. Six actors and six dancers performed a version of the Dickens novel and we won the Spirit of Mayfest Award at that year's festival. 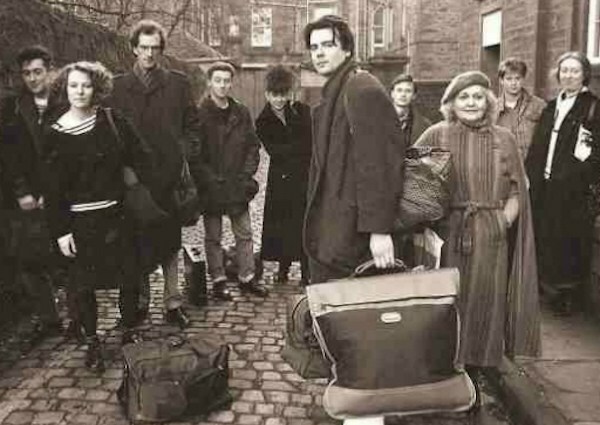 The production went on to tour Scotland and Northern England. I played Pip. I really enjoyed this show because the actors really had to dance and the dancers really had to act. As I was playing the lead I had to dance a lot, and I think this show really cemented the way I think about acting, in that I think of characters in a very physical way first, and put great emphasis into the way any character moves. The cast included my Victor and Barry partner Forbes Masson, and fellow RSAMD students James Kennedy, Alasdair Galbraith and Rachel Ogilvy. 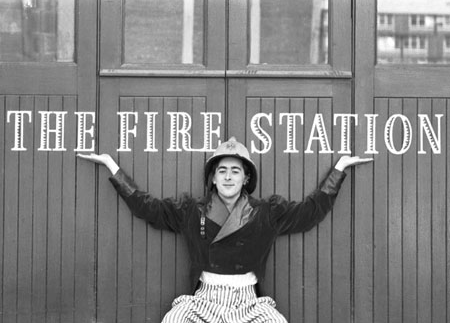 I returned to Dundee Rep at the beginning of the year to play Phil McCann again in the second part of John Byrne's Slab Boys Trilogy. Cuttin' A Rug takes place at the carpet factory's work dance. I really loved this production because there was no set to speak of, and we had a really complex set of imaginary walls and mirrors and loos that became incredibly alive. The action picks up after Phil has discovered he didn't get into art school that day. The last last line of the play is one of my favourite ever: "You're nineteen, you've got a wardrobe full of clothes, you've got everything to live for."